This enjoyable third outing for the irrepressible Po and his anthropomorphic buddies is a DreamWorks co-production with China. It is also the first in the series to dive headfirst into the supernatural, featuring a bull from the spirit world who is collecting the qi of kung fu masters past and present. Kai (voiced by J.K. Simmons) crosses into the mortal realm with his jade army in preparation to steal the soul of Po, the ‘Dragon Warrior’ (Jack Black), who must face his adversary against a backdrop of other narrative threads. Red panda Shifu (Dustin Hoffman) wants Po to take charge over the Furious Five, and then Po’s absent father (Bryan Cranston) suddenly rolls into town. The appearance of pa throws Po into yet another existential meltdown, as he journeys to a secret panda village to learn how to live among his kind. 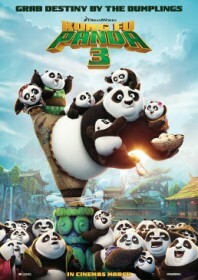 The film should appeal to younger audiences with its positive messages regarding identity and community, and because most of the humour is derived from slapstick, particularly once the film becomes overloaded with pandas from about halfway through. Visually, it is consistently resplendent and inventive (particularly during the sketched flashback sequences) and the franchise’s fun characters are easy company.